Mrs. Miner's Kindergarten Monkey Business: Back to School With a Bang! 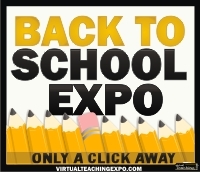 For a $10 ticket fee you will be able to attend the Back to School Expo (at your leisure, of course) AND receive a $168 valued goodie bag AND access to vendors with products 30% off their regular price (like myself!) until September 1st. Click above to get any and all details you want or to just purchase this deal of the day (available at this price until August 24th is over). Sounds like you'll be going back to school in style and equipped with lots of information for a small price of $10. (Did I mention you can get recertification credits for watching this expo in your pjs while drinking coffee?). I'm so excited! I signed up this morning and I can't wait! THANKS! I am going to sign up and hope for the best! When I tried to buy a ticket just now, it has the price as $19.95. Do I need a code to get it for $10. sap ui5 online training giving the bigittrainings .we are giving a good facuility,free demo classes,projectSAP UI5 Online Training Effectively implemented SAP ERP systems can have cost benefits. Integration is the key in this process. "Generally, a company's level of data integration is highest when the company uses one vendor to supply all of its modules.